In 1976, Yale Hirsch predicted a fifteen-year super boom—a move in the stock market of 500% or more. His forecast proved accurate as the market rose and continued upward, eventually posting growth over 1,000% just before the tech crash in 2000. 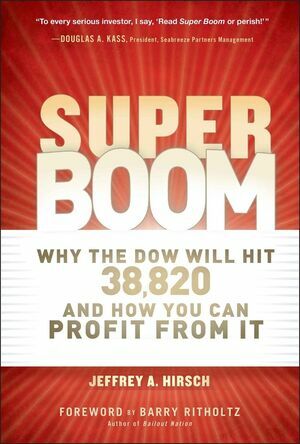 In Super Boom, Jeffrey Hirsch, President of the Hirsch Organization and Editor in Chief of the Stock Trader's Almanac, unveils the next market expansion. Building on his father's research from 1976, Hirsch has discovered that meteoric rises in stock indices are due to specific catalysts predominantly outside of the financial markets. History has a way of repeating itself, especially in the financial markets. The American economy, and subsequently the world economy, has always existed in a cycle of boom and bust: gold, grain, oil, technology, and most recently, real estate, have all bubbled and popped. The key to investing profitably is spotting macroeconomic historical trends and positioning to reap the benefits. Step-by-step, Hirsch puts together the pieces of this puzzle by revealing the central drivers of a super boom. As markets and economies struggle over the next several years, remember to keep your eye on the future and get ready for the coming super boom and the next 500% move in the market. With this book as your guide, you'll benefit from the insights that only Jeffrey Hirsch can provide. Jeffrey A. Hirsch is the President of the Hirsch Organization and Editor in Chief of the Stock Trader's Almanac. He worked with founder Yale Hirsch for fifteen years, taking over in 2001. He appears frequently on CNBC, CNN, Bloomberg, Fox Business, and many other national and international media outlets to discuss market cycles, seasonality, trading patterns, predictions, and historical trends. Hirsch also edits the firm's digital toolkit, Almanac Investor, a subscription-based product including investor alerts, market data, and research tools.